When will the H1N1 vaccine be available in the U.S.? The H1N1 vaccine is expected to arrive this coming week. Indeed, National Public Radio (NPR) is reporting that the first doses of vaccine will start arriving at hospitals, doctors’ offices and clinics around the country tomorrow . Vaccine makers are shipping the vaccine earlier than previously predicted to 21 states and the cities of Washington, New York, Chicago and Los Angeles . Where can I find the H1N1 vaccine when it comes out? Currently, there isn’t a list of locations where the H1N1 vaccine will be offered. Check with your doctor, your children’s school and/or your local health department. Additionally, once the information is available, the Department of Health and Human Services will post the information on Flu.gov. How many shots will be required? For adults, H1N1 vaccine studies show that a single dose will provide protection. Preliminary unpublished clinical trials on children ages 6 months to 9 years suggest that two doses will be required, separated by at least 21 days. Will I get swine flu from the H1N1 vaccine shot? No. The H1N1 vaccine shot contains an inactivated flu virus. Although you may develop a slight reaction to the shot, including soreness at the injection site, muscle ache or fever, you won’t get the flu because the H1N1 virus in the vaccine has been inactivated (killed). What if I’m allergic to eggs? Can I still get the vaccine? Individuals that have egg allergies should not get flu vaccines in the regular way, since the virus used to produce the vaccine is grown in eggs. You should consult with a physician or allergist prior to vaccination to determine the degree of egg sensitivity. For asthmatic children with severe disease and egg hypersensitivity, a regimen has been developed for the administration of influenza vaccine . What is the FluMist and who can get it? FluMist is a nasal spray flu vaccine, which contains a low dose of live but weakened flu virus. Similar to the flu shot, the nasal spray doesn’t cause the flu, but prompts an immune response so that your body develops antibodies necessary to fight influenza infection. Should my children get the vaccine? Children generally have a higher risk for contracting seasonal flu. The H1N1 flu is no exception. From April through July, the attack rate of laboratory-confirmed cases of H1N1 was highest among children aged 5-14 years — 14 times higher than for adults 60 years of age or older . Younger children also appear to be getting more severe cases of H1N1; the median age of hospital-admitted cases was 16 years of age. No vaccine is 100% safe since it’s designed to simulate the immune system to produce antibodies. That said, not all adverse reactions that happen after a vaccination are due to the vaccination. In clinical trials of the H1N1 vaccine thus far, there have been no serious side effects. The most common side effects reported were injection-site pain, headache, muscle pain, malaise and nausea. The Vaccine Adverse Event Reporting System (VAERS) is being used to monitor vaccine safety, and is being supplemented by surveillance in the military services, the Veterans Affairs system and a new “real time” health plan monitoring system covering 15% of the U.S. population . The H1N1 vaccine was produced the same way using the same materials as seasonal flu vaccines. However, the new H1N1 vaccine has received a great deal more scientific scrutiny than seasonal flu vaccines. Clinical trials on the H1N1 vaccine, which were performed to determine the dose required to stimulate an immune response, aren’t performed on the seasonal flu vaccine. There were a number of cases of Guillain-Barre syndrome with the 1976 National Influenza Vaccination Program for swine flu. Should I be concerned with the new H1N1 vaccine? In 1976, an earlier type of swine flu vaccine was associated with cases of Guillain-Barre syndrome (GBS), a disorder that causes the body’s immune system to attack parts of the nervous syndrome. The rate of occurrence was 2 in 100,000 (the syndrome normally strikes 1 in 100,00) . The CDC anticipates that the N1N1 vaccine will have a similar safety profile as that of the seasonal flu vaccine, which is very good and has not been consistently associated with GBS. There have been no reports of GBS in the current H1N1 vaccine clinical trials. Will the H1N1 influenza vaccine contain thimerosal? 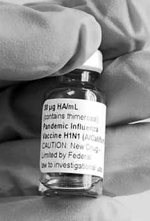 The H1N1 vaccine is being manufactured in several formulations. Multi-dose vials will contain thimerosal (a mercury-based preservative) to prevent potential contamination after the vial is opened . Single dose units will not contain thimerosal. In addition, the FluMist will not contain thimerosal. Will the H1N1 vaccine contain adjuvants? No. Adjuvants (immune stimulating compounds) are not being used in the H1N1 vaccine being distributed in the United States. Can I get the seasonal vaccine along with the H1N1 vaccine? Although simultaneous and sequential administration of seasonal influenza vaccine and the H1N1 inactivated vaccine is currently being studied, existing recommendations are that two inactivated vaccines can be administered at any time before, after, or at the same visit as each other . Note that this does not include the FluMist, since it is a live modified flu virus. Do I need a flu shot if I’ve already had the flu this year? If you’ve had the flu this year, you’re immune to that specific virus, but there’s no guarantee you won’t catch another seasonal strain. Additionally, if you’ve had a seasonal flu strain, you’re not immune to the H1N1 virus. Your best bet is to get vaccinated against both the seasonal flu and H1N1. If I’ve had swine flu, do I need the H1N1 vaccine? If you’ve had the swine flu this year, then you’re resistant to reinfection since your body has generated antibodies specific to the virus. However, you should still get the H1N1 vaccination, since most suspected H1N1 cases are diagnosed without laboratory confirmation. Additionally, if you’ve had H1N1, you’re not immune to any of the seasonal flu strains and should get vaccinated against the seasonal flu. What if I don’t want to take the H1N1 vaccine? For the public, H1N1 flu vaccination is voluntary. All military personnel will be vaccinated against the H1N1 flu virus and many medical centers are making vaccination mandatory. Remember, like any other flu, H1N1 is contagious. Scientific evidence suggests that the virus can live in some people for at least eight days . If you get sick or think you’re sick, stay home! In addition to vaccination, one of the best ways to avoid getting sick is to effectively wash your hands and limit the spread of infection. Remember that coughing and sneezing can spread cold and flu germs. Survey Finds Just 40% of Adults “Absolutely Certain” They Will Get H1N1 Vaccine. Harvard School of Public Health. 2009 Oct 2. What You Need To Know About Swine Flu Vaccine. National Public Radio. 2009 Oct 5. H1N1 vaccine on schedule, official says. CNN. 2009 Oct 1. Murphy and Strunk. Safe administration of influenza vaccine in asthmatic children hypersensitive to egg proteins. J Pediatr. 1985 Jun;106(6):931-3. Centers for Disease Control and Prevention (CDC). 2009 pandemic influenza A (H1N1) virus infections – Chicago, Illinois, April-July 2009. MMWR Morb Mortal Wkly Rep. 2009 Aug 28;58(33):913-8. CDC H1N1 Flu | General Questions and Answers on Guillain-Barre syndrome (GBS). Centers for Disease Control and Prevention (CDC). 2009 Sep 14. CDC H1N1 Flu | General Questions and Answers on Thimerosal. Centers for Disease Control and Prevention (CDC). 2009 Sep 14. Kroger et al. General recommendations on immunization: recommendations of the Advisory Committee on Immunization Practices (ACIP). MMWR Recomm Rep. 2006 Dec 1;55(RR-15):1-48.